For many of us, one of the most satisfying elements of the Thanksgiving holiday is sitting down to a large family-style meal. That shared experience with food offers a sense of connection and belonging to family and friends who are important to us. We thought you’d appreciate the following article by Jenna Whitson of Hunger Free Vermont, which explores the many ways eating family-style can developmentally benefit the youngest among us. Also, if you haven’t already donated to your local food shelf this holiday season, click here to find out how you can help ensure that all of our youngest children can benefit from a family-style feast this holiday. Jenna Whitson is a Child Nutrition Advocate at Hunger Free Vermont, a statewide education and advocacy organization committed to ending the injustice of hunger for all Vermonters. Jenna works with child care providers, schools and afterschool programs to ensure that Vermont's children have access to nutritious foods in child care settings and after school and advocates at the state and national levels to improve access and support for providers. Jenna also serves as a member of the Let's Grow Kids Speakers Bureau. Let’s Talk Turkey About Family-Style Meals! Each day, children in homes and child care centers across Vermont sit down family-style to share nutritious meals with their caregivers. According to the Academy of Dietetics, enjoying a meal family-style supports the development of critical motor and social skills for our youngest children, and teaches life-long healthy eating habits. With the majority of Vermont's children spending a significant portion of their day in care outside of the home, serving them meals family-style in the child care setting offers a fantastic opportunity for growth, learning and development. For such an event, child-sized tables are set with plates and utensils, and food is passed in small containers for children to serve themselves. Children sit together with staff from the program to pass around the dishes and to share in conversation about the food and their day. Family-style meals help to nourish a c hild’s rapidly growing body and brain. In addition to those physical benefits of good nutrition, eating meals family-style can have a positive influence on children’s beliefs and attitudes about food, impacting their nutritional choices throughout life. A study out of the University of Illinois College of Agricultural, Consumer, and Environmental Sciences explains that family-style meals give children a chance to learn about portion sizes and responding to hunger cues, which could prevent obesity and related chronic health conditions. Children are less likely to overeat and adults can discuss appropriate portion sizes as the children serve themselves. Feeding becomes learning. If a child develops these skills in infancy through preschool, it sets them up for meeting all their nutritional needs throughout their life, reduces risk of chronic disease and obesity, and supports optimal cognitive development during a time of rapid growth. Self-esteem & independence: Passing food around the table and serving themselves allows children the freedom to make their own choices. When given the opportunity to share and discuss the foods included in the meal with their peers and teachers, children feel a sense of accomplishment, ownership and independence. This sets the stage for a child to be ready to take risks with new foods. Social skills: As children pass bowls and utensils around the table, they get to practice appropriate table manners, sharing, patience and taking turns. Nurturing & responsive relationships: Conversations at the meal table provide the opportunity to interact in a focused and intentional way with adult caregivers and peers. Language skills: Adults at the table can encourage language development by talking about the food at the table, where it comes from, or what it tastes or smells like. 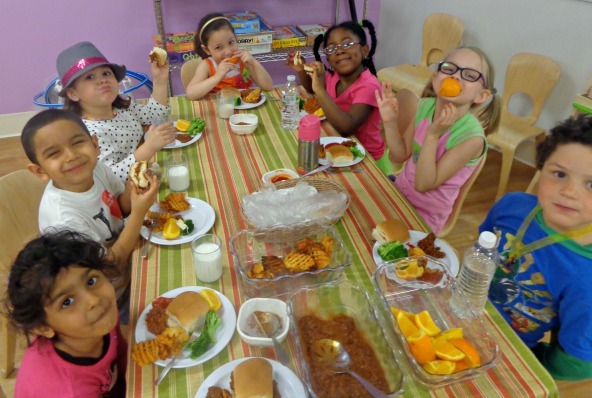 Belonging: Mealtime conversation provides a comfortable and relaxing atmosphere in which children feel a sense of belonging to a nurturing community and a safe, stable environment. Mealtime can be messy and spills can be expected, but practice and persistence results in children who have positive early experiences, feel more comfortable and relaxed, and develop important skills that will last a lifetime.